Ian Anderson (Fightback Whanganui-a-Tara/Wellington) provides a broad overview of neoliberalism, a period of capitalism marked by insecurity and poverty wages. In the last 30 years, communities have been shattered, social contracts broken, workers divided. For those of us under 30, unions are a novel (even unknown) concept, now covering around 10% of the private sector. Some call this a ‘post-industrial’ period, yet industrial production has expanded globally; capitalists just have more ability to globally shop around for the fastest and cheapest deal. Some call it the decline of the nation state, yet repressive militarist measures keep expanding, finding new technological forms; in Bourdieu’s terms, the “left hand” of the state has retreated while the “right hand” of the state advanced. The basis of stability has shifted. In the ‘Social Democratic’ heyday from the 1950s to the 1970s, capitalism in the imperialist core was stabilised through a corporatist deal between labour, capital, and the state. Since the neoliberal assault on organised labour, living standards have come to depend on credit; the housing market, credit cards, growing private debt. For David Harvey, neoliberalism is a system of renewed “accumulation by dispossession,” through the expansion of financial markets. In Aotearoa/NZ the National Party’s supposedly ‘mixed’ policies, including the further privatisation of power companies, sale of state housing, and undermining of workplace rights fit this pattern. UNITE General Secretary Mike Treen recently asserted that the current National government is “not a radical neoliberal government.” I would suggest the neoliberal offensive (or attack) of the ’80s and ’90s largely won, and we are in a period of entrenchment. Many of the more brutal attacks of the offensive period – mass redundancies, destruction of unions, slashing of benefits – are no longer necessary. None of the flagship policies of Rogernomics and Ruthanasia have been substantially reversed. Market intervention to save the finance sector is nothing new, and has occurred where necessary throughout the neoliberal period (the ultra-right dream of stateless capitalism never existed). Yet the 2008 financial crisis rocked the confidence of the international ruling class. ‘The current economic crisis gives another opportunity to show that Europe serves its citizens best when it makes concrete action the touchstone. Europe can make the difference. In difficult times, the temptation is to feel powerless. But Europe is not powerless. The levers of government, the instruments of the European Union, the influence of intelligent coordination add up to a potent force to arrest the trend towards a deeper recession. A Europe ready to take swift, bold, ambitious and well-targeted action will be a Europe able to put the brakes on the downturn and begin to turn the tide. We sink or swim together. (…) The fundamental principle of this Plan is solidarity and social justice. In times of hardship, our action must be geared to help those most in need. To work to protect jobs through action on social charges. Yet Europe would soon embark on a violent ‘austerity’ project that reduced government spending without addressing the root of the crisis. In the US, the story has become a cliché; Barack Obama, elected on a platform of “Hope” and “Change” in 2008, failed to deliver much in a first term with a Democratic majority. Aotearoa/NZ was not shocked by the global economic crisis, in the same way as the US and Europe. We haven’t seen the extremes of austerity faced by Greece, facing 25% unemployment. However the long-term trends (declining real wages, retreating social services, declining home ownership and state housing) remain stready. A property bubble continues to grow, which both Forbes and local bankers predict will have to burst. National may make the occasional minor compromise, but of course they show no interest in reversing these trends. Measures like the Trans Pacific Partnership Agreement (TPPA) seek to further entrench this regime internationally. Because of this institutional entrenchment, we need a political andindustrial movement, a national and international movement more than ever. Some argue that Aotearoa/NZ is facing neo-colonisation. It might be more accurate to say that Aotearoa continues to be colonised by New Zealand, the European nation-state that bloodily imposed capitalism and now asks that the most oppressed simply forget history. New Zealand consistently ranks with the top 10 countries in the UN Human Development Index, which consists largely of European countries or colonised ‘neo-Europes’ like the United States and Australia. New Zealand is a member of the Organisation for Economic Cooperation and Development (OECD). Formed in 1961 to promote “democracy and the market economy,” the OECD is essentially a Cold War bulwark. Of OECD countries, NZ’s standard of living is about average. New Zealand collaborates with the North Atlantic Treaty Organisation (NATO), another Cold War bulwark. For some left critics, New Zealand’s collaboration with US imperialism is unequal, exploitative. This ignores New Zealand’s relatively high standard of living and cultural affinity with other mainly white, English-speaking countries. The fact that a country with high rates of child poverty sits near the top of the global pyramid paints a grim picture of international capitalism. It also shows the importance of international solidarity. “[Neoliberalism] poses an old dilemma in new terms, namely the division between reformists and revolutionaries. Well, reformism requires believing that some progressive reforms are possible — pro-labor reforms, the promotion of welfare, etc. — within the terms of the system. This fight for basic reforms does not mean socialists should all fall in behind the Labour Party (Syriza emerged as an alternative to the old ‘centre-left’ party). In a sense, there are no reformist parties left in parliament – although the Greens and Labour certainly have reformist members and supporters. Whereas the early Labour Parties sought a reformist path to socialism, the Fourth Labour Government initiated neoliberal attack in Aotearoa/NZ, and the Fifth Labour Government maintained the bulk of these attacks. Even former Green Party co-leader Russell Norman infamously described himself as ‘more pro-market’ than the Nats. It’s no surprise that voter turnout has reached record-low levels (especially among marginalised groups), and it would be dishonest to fall in behind the Labour Party. Socialists may seek newrepresentation in parliament, but this can be perverted or defeated without a strong anti-capitalist movement in the community. Although neoliberalism shut down old frontiers of struggle, like any oppressive system it also opens up new frontiers. Today the majority of union members are women, and the frontlines of union organisation are in casualised and low wage sectors. Campaigns for a Living Wage and against Zero Hour Contracts are gathering public momentum. 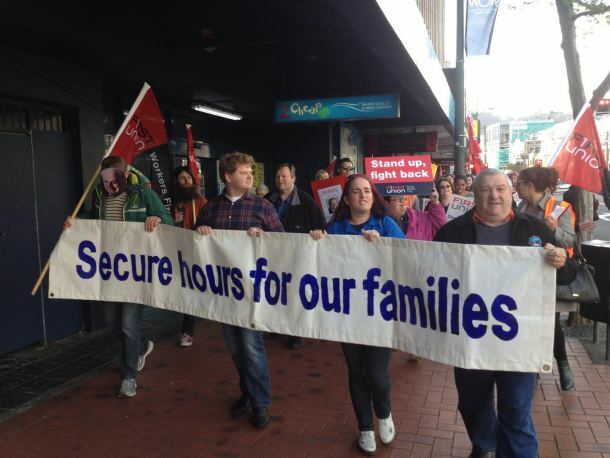 Recent years have seen a defensive struggle against casualisation in established union sectors like meatworks and the public sector, and an offensive struggle against casualisation in formerly unorganised sectors like service and hospitality (Socialist Perspectives for Aotearoa/ New Zealand, CWI Aotearoa/NZ). Members of Fightback and other socialist groups have played a major role in UNITE’s fight for job security. The neoliberal regime polarises hours of work, with many underemployed (working less than 20 hours) and many overemployed (working more than 50). Conflicting and competing schedules do not lend themselves to collective organisation; in fact that is the aim of a competitive labour market. In light of this instability, socialists assert rights to stability and control. This means a universal basic income, jobs for all who are ready to work, with dignified work and guaranteed hours (say 20 hours a week across sectors). If real socialism is campaigning for crèches and demanding rights for mental health users and pushing for bicycle lanes and supporting a local strike, isn’t it a little dull and shabby and boring? Well, no, because the delight is how UTTERLY HORRIFYING our demands for simple human things is in the eyes of those whose careers depend on realising profits for capital.